We had decided to pack four gallons of water just in case something went awry during our second cold weather camping trip this season. 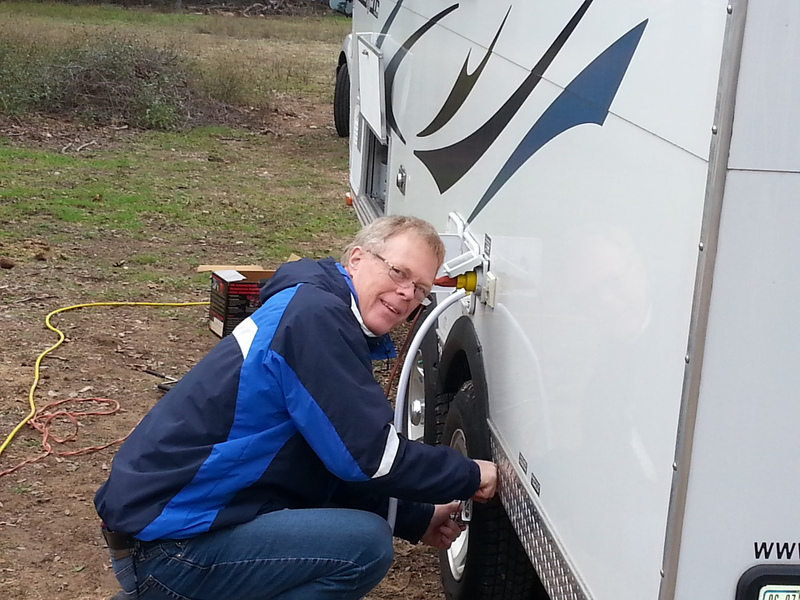 The related online blogs recommended this among other tips such as purchasing a heated hose and waiting to un-winterize the travel trailer until we had traveled enough south to avoid freezing temperatures overnight. And so we prepared accordingly reviewing our long “To Do” list of stuff over and over again before heading out the door. Check! Just before our departure, arctic temperatures plagued the entire country east of the Mississippi River from Michigan to northern Florida! Who knew that after driving nearly 800 miles due south we would still be facing weather more characteristic of Indiana than our first destination in the deep south of Fort Rucker, Alabama? We had run the propane heater in the Camp Lite a few times back home to minimize the out-gassing of the relatively new-used mini furnace. We intended to fire up both heaters (propane and electric) soon after hooking up everything upon arrival so we could sleep comfortably. Check! After all it would be about 5:00 in the morning when we got to stop number one. We did not count on the entire camper freezing over along the way! I grabbed the hair dryer and extension cord from the cab of the truck and proceeded to thaw out both door locks. Once inside I discovered that the four “emergency” one-gallon jugs of water were frozen solid as was the entire water system “winterized” with special RV antifreeze! We had our two sport-sized bottles of water 1/2 filled with us in the car and that was it. Closer investigation found some frigid water sloshing around in one of the gallon jugs so we gave it to our pup figuring she would not mind the temp. (Sure would hate to have to choose between man and beast on such a night!) Steve used a, er, warm water stream to punch a hole in the toilet ice seal to make it operational for the night. Check! Hooking up the water and electric did not go well either. The water spicket had frozen beneath the towel that our southern/Aussie host (formerly from Indiana) had prepared before our arrival. Hmmmmm. When the crochety 30 amp electrical hook-up proved to be broken, Steve plugged us into the standard outlet to get us through the night, thus preventing draining our battery overnight. Oh well, we could live without hot drinks in the microwave: we had the warmth of each other after all . . . But our bedding felt like it had just come off the train from Siberia! 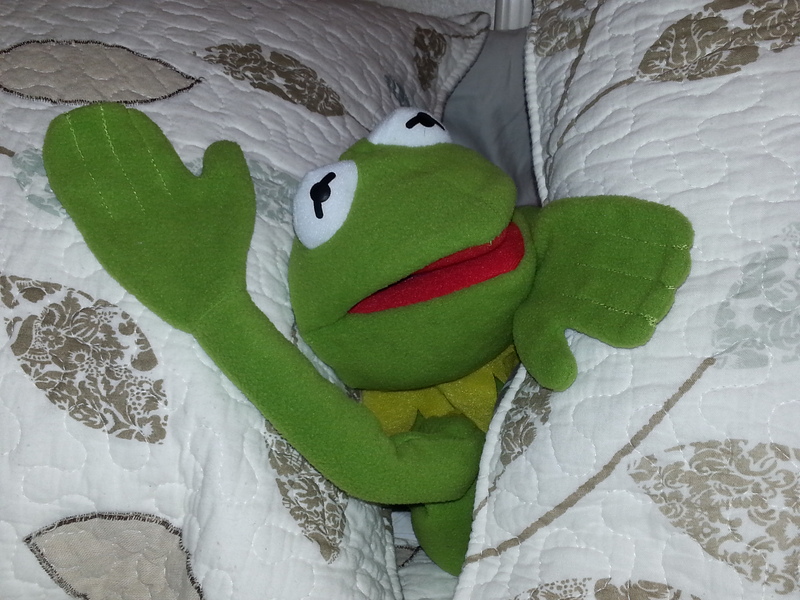 Steve bundled up head-to-toe in Smart Wool and collapsed into bed. I tried to join him but the nighttime unpleasantries I often face reared their ugly head first. Eventually the buzzed feeling I had from the late night excitement, convulsions and checking of Facebook yielded enough fatigue to turn everything off in my head for a few hours. Even the sound of street noise 50 feet from our pillows drifted into the distance. We had made it to see my hubby’s darling youngest son and his wife the next day and I was glad. Check! Who knows why our lives are so difficult these days. The last two times this past year we gratefully were able to camp with the conveniences of a travel trailer in colder weather we certainly prepared as best we could. It’s not like we did not know what we were doing! I perused and posted questions on multiple camping forums to learn from more seasoned travelers. We purchased some special gadgets and kept snow pants, hats and gloves nearby; Steve donned his biking/paddling headlamp upon arrival like a pro to keep his hands free during the late night procedures. I had enough food prepared in individual and meal-sized portions to keep me compliant with my special diet and the skilled driver nourished for most of our first few days away from home. We did the best we could to avoid disaster and this is just how it goes sometimes! The next day was a blur for me. Yes, we said hello to Daniel and Elizabeth when they stopped by in their Honda Fit (everything is so cute about these two!) midday. I had not eaten breakfast yet and needed some more recovery/rest time so Steve took off with them while I headed back to the tin can ranch. What happened next can only be called a near-death experience! That one deserved its own blog story so I won’t go into it here. What is clear is that my writing block of late is definitely broken with some new experiences ordained by my Jesus albeit AFGE if you will (aka “another fun growth experience”)! As in the Wizard of Oz when Dorothy turns to her dog Toto after the great tornado, I’ll say it here, “Toto, we are not in Kansas anymore” and that is good. My social and geographical isolation enduring illness at home is now broken for a time. What matters now is faith in the Lord and obedience for His will and I know that His goodness shall prevail. Yeah God! Camper mascot Kermit the Frog here! Next If I get to see you . . .